We all know someone who spent thousands of dollars on hearing aids that sit in dresser drawers, right? The team at Audiology Concierge is determined improve the traditional path to better hearing. After years of working with the hearing impaired, it became apparent to founder Nancy Jablonski that few loved their hearing aids; the concept of an in-home audiology concierge service began. 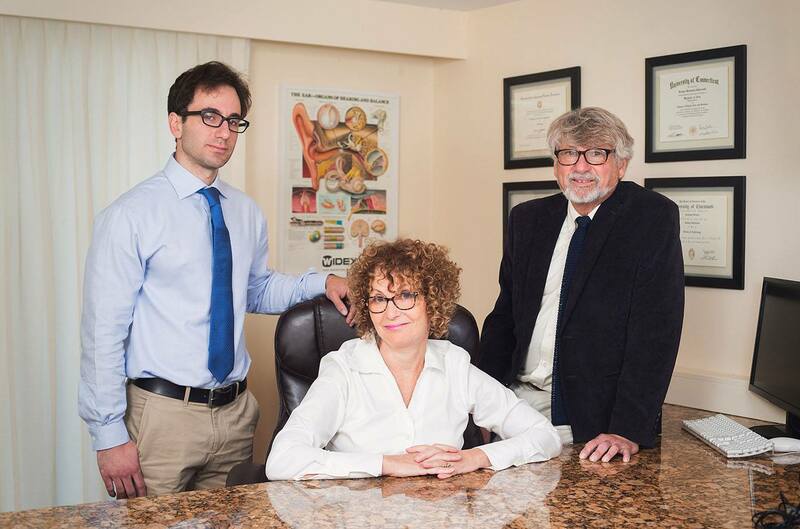 Nancy Jablonski, René Vicedomini and Dr. Josh Jablonski now travel throughout Connecticut, New York and beyond providing hearing evaluations, hearing clinics, hearing seminars at senior centers, retirement communities, doctor offices and personal residences. The “Return of the Doctor’s House Call” is an important necessity to provide quality follow-up care for patients with hearing devices. Nancy along with her partner Rene are hearing impaired and both proudly wear hearing aids. Whether you are a rock n’roller baby boomer or spritely senior, you deserve to work with the best professionals who deliver impeccable and personalized service, while providing state of the art hearing aid technology. When you are fit properly with a hearing aid, we can help restore your hearing to the quality and lifestyle you seek, all in the comfort of their own home. Say good-bye to impersonal offices and wholesale clubs. No more wearing inadequate or poorly fitted devices. Audiology Concierge was founded to provide a world class service model to people who may be exploring hearing assistance for the very first time or needing an upgrade, with a personal and private approach. Dr. Jablonski earned his Doctorate in Audiology degree (Au.D.) from the University of Cincinnati and has since been working in a range of clinical settings, including Ear, Nose and Throat medical offices in Connecticut and New York. Dr. Jablonski has experience in comprehensive diagnostic testing for the adult and geriatric populations, along with complete knowledge of advanced hearing technologies. Other areas of experience include electrophysiological and vestibular testing, Auditory Brain Stem Response (ABR), Electrocochleography (ECoG), and Electronystagmography (ENG)/ Videonystagmography (VNG). He is a member of the American Speech, Hearing and Language Association, and a Connecticut and New York State licensed Audiologist. Nancy Jablonski, Audiologist and René Vicedomini, Hearing Instrument Specialist, have over 25 years of experience fitting hundreds of hearing impaired patients in Universities clinics, hospitals and private practices. Both Nancy and René have worked for major hearing aid manufacturers, understand hearing aid technology and more importantly, how necessary it is to provide a proper fit. No more excuses. If you are losing your hearing, admitting it is the big first step to recovering it. Audiology Concierge is proud to offer in home hearing services so you don’t have to worry about transportation. Our appointments are designed to be most convenient for you. We offer free, weekly and monthly hearing clinics at various locations. Please see our Clinic Schedule page for more details and discover how they are Empowering Lives Through Better Hearing!